“Tax Cuts and Jobs Act of 2017” is changing many aspects of the tax planning process and we discussed many of them in this post. One area in particular is important to our firm and its clients as it involves investment management expenses, including Gordian Advisors fees. Starting in 2018, investment management fees will no longer be tax-deductible because their entire category of Miscellaneous Deductions has been eliminated (most people won’t itemize anyway with the increased standard deduction). Ok, with that out of the way, let’s get in those weeds. In the past we largely deducted all our fees (including those attributable to the IRA accounts) directly from clients’ taxable accounts while some paid by check with after-tax dollars. The clients (or their CPAs) would then deduct the portion over 2% of AGI on their tax return. We can continue this billing practice, however, the fees paid in such manner are no longer tax-deductible to any extent. We now recommend implementing a billing process where IRA accounts directly pay fees attributable to them. This fee payment would not be considered a taxable withdrawal and would be made in pre-tax dollars thus creating an implicit tax deduction. Each IRA account can only pay its own share of fees or risk being disqualified by IRS (very bad). This works for all pre-tax retirement accounts (SEP, SIMPLE, 401k, etc.) but I’ll refer to them as IRAs for the purposes of this post. We would continue to charge fees attributable to taxable (Joint, Trust, Individual Brokerage, etc.) and Roth IRA accounts to your taxable accounts. We are in the process of contacting each client individually if we think they’ll benefit from making this change starting with first quarter billing in early April. To illustrate what this might mean under various situations we present a few scenarios in Exhibit 1. Note that we made several simplifying assumptions including uniform annual investment management fee of 0.70%. 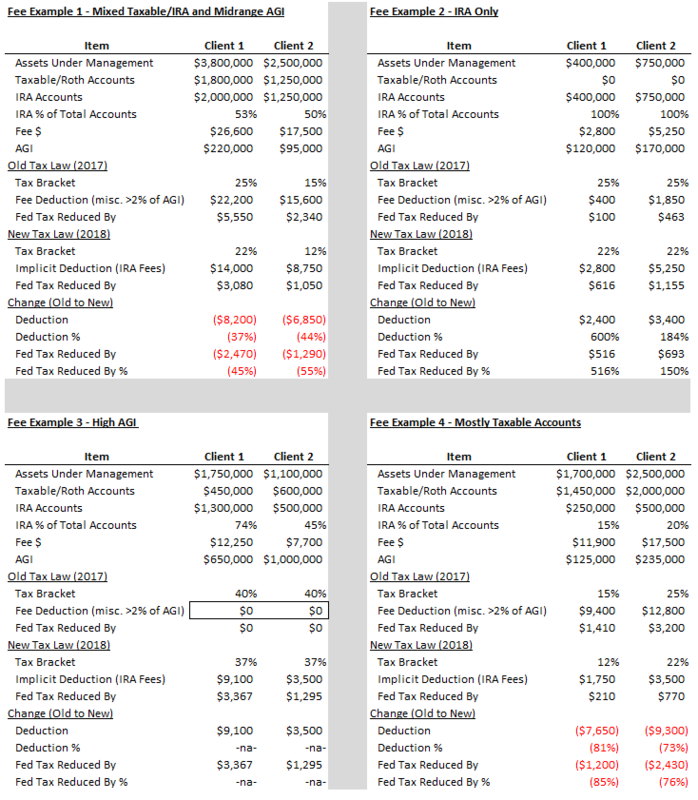 Example 1 shows a “typical” situation of about 50% taxable/50% IRA account split and AGI in the middle tax brackets. Depending on the interplay of AGI and account split, the client in this category will see their “Deductions” and Fed Tax Reduction drop roughly proportionally to the % of assets in taxable accounts. Example 2 (all or mostly IRA money) is the sweet spot where clients will actually benefit from this change as they’ll be able to “deduct” the entire IRA fee without the 2% of AGI limitation! High AGI clients in Example 3 is another category that will be better off as their high income eliminated any pretax deduction under the prior rules (fee were lower than 2% of AGI). Charging fees directly to their IRA accounts makes great sense under the new rules (or the old ones for that matter). People with majority of their investments in taxable accounts (Example 4) will experience the most adverse impact under the new rules. If you are interested in even more technical details on this issue, Michael Kitces did a great post on his Nerd’s Eye View blog. It’s geared toward financial advisors and CPAs, so it would be an overkill for most non-professionals. We are happy to discuss this issue with our clients in any level of detail, so please let us know if you would like to do that!